In questa pagina abbiamo inserito una sezione dedicata ad oggetti preziosi per gli amanti dell’Animazione che fanno parte della nostra collezione, tra questi, i premi alla carriera ricevuti dagli artisti di questa incredibile arte. Lou Scheimer 2012 Inkpot Award (Filmation Studios, 2012). Each year, Comic Con International bestows its highest honor, The Inkpot Award, on those who have made significant contributions in comic books, comic strips, animation, science fiction, and pop culture. 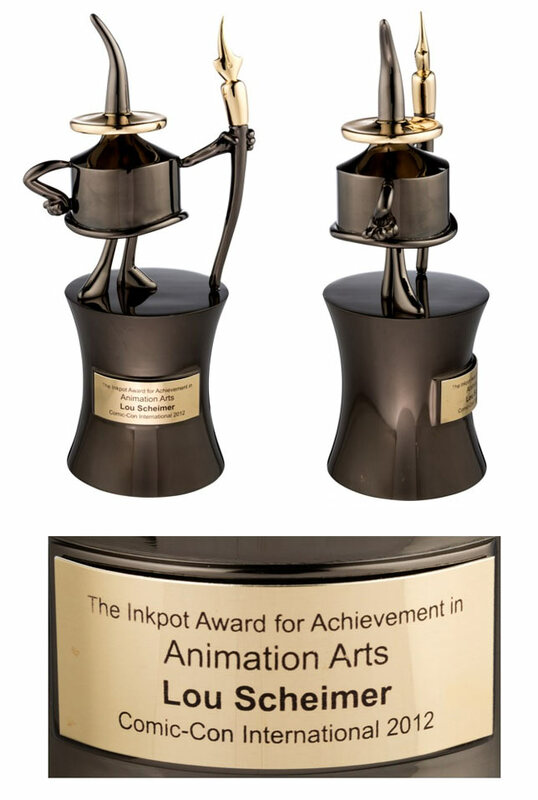 This is the personal 2012 Inkpot Award presented to animation legend, Mr. Lou Scheimer (1928 - 2013). These extremely prestigious industry awards almost never come up at auction! Includes a fully-engraved award plaque. The award itself stands 10" tall. In Very Good condition. From the Lou Scheimer/Filmation Archives. Louis "Lou" Scheimer (October 19, 1928 – October 17, 2013) was an American producer, one of the original founders of Filmation, an animation company, and also credited as an executive producer of many of its cartoons as "Tarzan, Lord of the Jungle", "He-Man and the Masters of the Universe" and "Bravestarr". 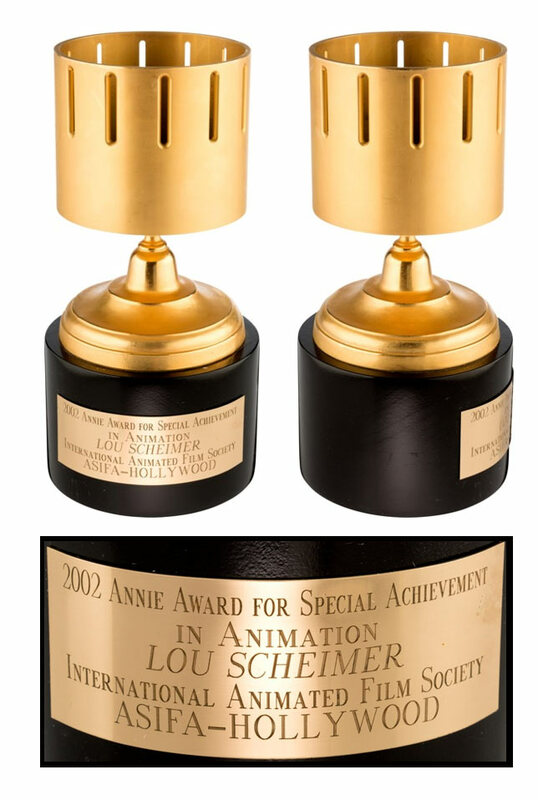 Lou Scheimer 2002 Annie Award (Filmation, 2002). The prestigious Annie Awards first began back in 1972. Legend holds that it was originally voiceover legend June Foray's idea to have an awards ceremony which would acknowledge the animation industry. This is the Annie Lifetime Achievement Award Presented to Lou Scheimer in in 2002. It acknowledges his "Special Achievement in the Field of Animation." Designed by Tom Woodward, the historical zoetrope serves as its model. Very few Lifetime Achievement "Annies" ever come to market! Award has full dedication plaque and stands 9.5" tall. In Fine condition. From the Lou Scheimer/Filmation Archives.